Protect your skin from harsh UV rays with the highest UV protection level while maintaining long-lasting hydration and smoothness. Ingredient Water, dipropylene glycol, ethylhexyl methoxycinnamate, alcohol, propylene glycol dicaprate, bis-ethylhexyloxyphenol methoxyphenyl triazine, dimethicone, salicornia herbacea extract, inula britannica extract, angelica acutiloba root extract, coix lacryma-jobi ma-yuen seed ferment filtrate, melothria heterophylla root extract, butylene glycol, sodium acrylate/sodium acryloyldimethyl taurate copolymer, isohexadecane, polysorbate 80, isopropyl titanium triisostearate, xanthan gum, polyglyceryl-10 palmitate, BHT, cetearyl alcohol, talc, sodium metabisulfite, behenyl alcohol, polyoxyethylene stearylether phosphate, polyoxyethylene ether phosphate, PEG-60 hydrogenated castor oil, polyhydroxystearic acid, polymethylsilsesquioxane, hydrogen dimethicone, diphenyl dimethicone, dimethicone/phenyl vinyl dimethicone crosspolymer, glycerin, alcohol denat., phenoxyethanol, fragrance, mica, titanium dioxide, zinc oxide. • In the morning, apply after preparing skin with treatment lotion and emulsion. • Take an amount about the size of two pearls onto palms and rub into skin. • Apply foundation afterwards. To remove, use a facial cleanser and wash thoroughly. Whitening day emulsion with gentle Oriental herbal extracts that not only protect but promote the translucency of bare skin from the inside*. Formulated with active whitening ingredient tranexamic acid. Inhibits melanin production, prevents age spots and freckles. Deals with changing environments – such as daytime stickiness and dryness from air conditioning – to maintain daytime moisture balance. Can also be used as a makeup base. After application, it naturally boosts skin’s brightness to enhance the translucency of bare skin. Formulated with sebum-absorbing powder derived from the Orient. Prevents dullness due to sebum and boosts makeup hold. 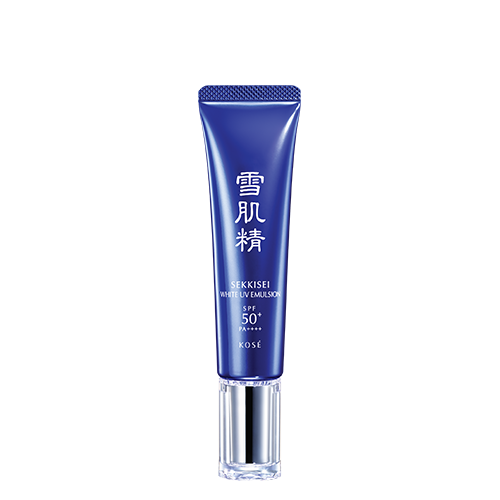 - Feels lightweight yet provides SPF50+/PA++++ protection, the highest level in Japan. Doesn’t feel heavy on skin, with a texture that is comfortable for everyday use. - SEKKISEI’s trademark modern floral fragrance. - Formulated with Oriental herbal extracts [Fermented coix seed extract, Angelica extract, Melothria heterophylla (white lotus) extract, Inula flower extract, and Salicornia europaea (glasswort) extract] and glycerine (moisturising).